By Tommy Goudge (July 28, 2013) – Two huge events are set to go at Ohsweken Speedway this week. NASCAR champion Tony Stewart will take on the best drivers from Ohsweken’s Corr/Pak Merchandising Sprint Car division, and DIRTcar 358 Modifieds return to Ohsweken in the Northern Summer Nationals presented by Burger Barn on Monday, July 29, while the World of Outlaws Sprint Car series contests the “Six Nations Showdown” on Tuesday, July 30. Ohsweken’s HRW Automotive Mini Stocks, and Gale’s Auto Aftermarket Bombers will join the Corr/Pak Merchandising Sprint Cars and DIRTcar 358 Modifieds on Monday, while the Affordable Towing & Recovery Thunder Stocks will support the World of Outlaws on Tuesday. 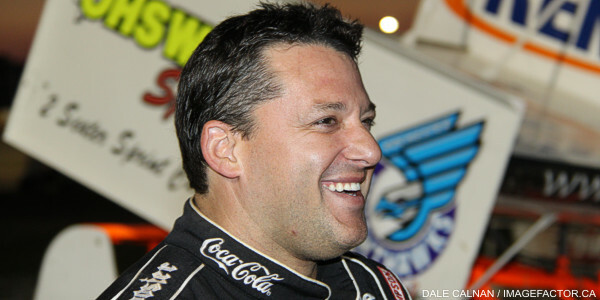 Tony Stewart’s return to Ohsweken has been one of the most highly-anticipated events of the Ontario racing season. 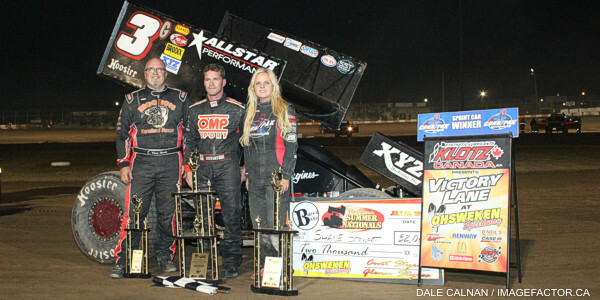 He made his Ohsweken debut in 2011, and has since claimed wins in 3 of the 4 events he has run, including both World of Outlaws Sprint Car series races. Stewart’s illustrious racing career began on Indiana dirt tracks, and he has never forgotten his roots, despite unprecedented success in the highest echelons of racing. “Smoke” is the only driver with NASCAR, IndyCar, and USAC championships on his resume, and he was the first to win USAC’s “Triple Crown” – Silver Crown, Sprint Car, and Midget titles in the same season. The Columbus, IN driver still competes regularly in dirt track events, despite his busy schedule not only as a NASCAR star, but team owner as well. He is currently 22nd in the World of Outlaws championship standings, despite only running a partial schedule. Stewart is also involved in dirt track racing in an ownership capacity, with involvement in several facilities including the famous Eldora Speedway, and owns several dirt track racing teams too, including those of Steve Kinser, and Donny Schatz. Tony Stewart will take on Ohsweken’s tough weekly Corr/Pak Merchandising Sprint Car teams in an event that pays full points towards their season championship. 2011 division champion Jim Huppunen is the current Corr/Pak points leader, and claimed a runner-up finish on Friday night. Mitch Brown took the feature win on Friday night, and sits second in the standings, followed by Jamie Collard, Todd Hoddick, and Glenn Styres. The 358 Modifieds will return to Ohsweken for the first time in 5 years, and promise to bring a competitive field on Monday night. “Mr. Small Block” Pete Bicknell claimed the feature win in the most recent 358 Modified event at Ohsweken, held on August 8, 2008. Bicknell currently leads the Merrittville Speedway standings, and will be back on Monday night, along with plenty of top drivers from the Niagara area and beyond, including Humberstone Speedway points leader Erick Rudolph, Mat Williamson, Chad Brachman, Fred Carlton, Billy Bleich, Sr., Brandon Easey, Chad Chevalier, Chris Steele, Todd Gordon, Ryan Susice, Mike Bowman, Tommy Flannigan, Shayne Pierce, and more. Alex Schuts saw his lead cut to just 1 point in the Mini Stock standings on Friday night. Davey Boughton is the second place driver, followed by Jason Lungaro, Laura Hughes, and Robin Elliott. Dusty DeBoer holds a slim 3 point lead in the Bomber standings over his brother Tim, who claimed his first feature win on Friday. Jesse McDonald, Max Chechalk, and Brady Longboat round out the top 5. The World of Outlaws Sprint Car series regulars have been busy this season, with 50 feature events already in the record books to date. Their visit to Ohsweken on Tuesday ends a three race eastern Canadian swing which began at Drummondville, Quebec on Saturday, and was scheduled to continue at Cornwall, Ontario on Sunday until weather intervened. Oklahoma driver Daryn Pittman leads the World of Outlaws standings heading into Tuesday’s event. Pittman has claimed 8 wins this season, compared to 12 for Donny Schatz, but consistency has been the key as Pittman has a series-leading 33 top 5 finishes so far. Schatz is second in the standings, followed by Paul McMahan, Craig Dollansky, Sammy Swindell, Joey Saldana, Autodrome Drummond winner Cody Darrah, David Gravel, Steve Kinser, Kerry Madsen, Chad Kemenah, Kraig Kinser, and Jason Sides. The World of Outlaws Sprint Car series has competed at Ohsweken on seven occasions since the inaugural event in 2007. Jason Sides won that first event on July 25, 2007, and also recorded wins at Ohsweken on July 29, 2009, and July 30, 2010. Jason Meyers won at Ohsweken on July 28, 2009, while Donny Schatz won on August 1, 2010, and Tony Stewart took the checkered flag on July 27, 2011, and July 31, 2012. Ohsweken’s Thunder Stock division has seen incredible growth over the past few seasons, and could see a record field on Tuesday night. 39 cars were signed in for the most recent regular Friday night program, and well over 40 are expected this week. Jack Myers got the feature win on Friday, but Cory Turner leads the way in the championship standings. Jim Lampman is currently second, followed by defending champion Mike Thorne, Bryce Richardson, and Chris Dickie. A special “Meet and Greet” with Tony Stewart will take place at Ohsweken Speedway on Monday, July 29. Wristbands for the Meet and Greet will go on sale Monday at 1pm at the Pit Entrance Ticket Window. The price is $50. A limited number of bands are available. The Meet and Greet with Tony begins at 4pm. Advance Reserved Tickets for both the Burger Barn Northern Summer Nationals featuring Tony Stewart on Monday, July 29, and the Arrow Express Six Nations Showdown featuring the World of Outlaws on Tuesday, July 30 are on sale at the Ohsweken Speedway ticket office on Sunday and Monday from 10am to 6pm. You can order by cash or credit card in person, or with credit card by phone at 1-855-448-3478. Upgrade your tickets to pit passes on race day for $10 on Monday, and $5 on Tuesday. Plenty of primitive camping space is available on the Speedway grounds for a nominal one-time $20 fee. Breakfast will be served at the pit barn concession booth! 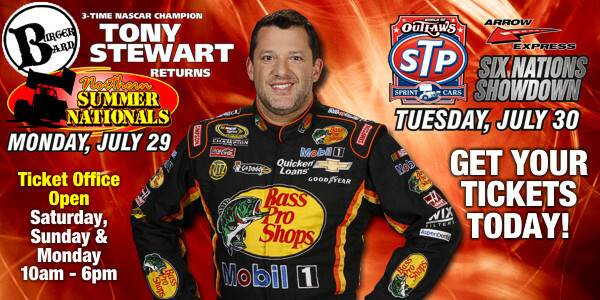 Burger Barn presents the Northern Summer Nationals featuring Tony Stewart on Monday, July 29. The Corr/Pak Merchandising Sprints, DIRTcar 358 Modifieds, HRW Automotive Mini Stocks, and Gale’s Auto Aftermarket Bombers are all part of this special event. Racing will begin at 7:30pm. Visit www.OhswekenSpeedway.com for more information. Arrow Express presents the Six Nations Showdown on Tuesday, July 30. The World of Outlaws Sprint Car series will be in action, along with the Affordable Towing & Recovery Thunder Stocks. Racing will begin at 7:30pm. Visit www.OhswekenSpeedway.com for more information.